You know Dr. Christiane Northrup as the bestselling author of books such as Women's Bodies, Women's Wisdom and The Wisdom of Menopause - a beloved and trusted expert on everything that can go right with the female body. Now she brings her wisdom and insight to illuminate the mind, soul, and spirit as well. 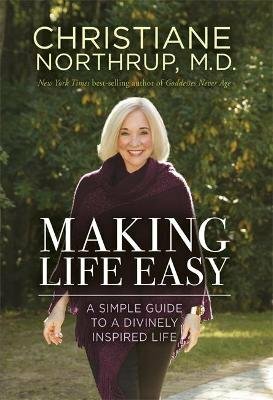 In this joyfully encouraging new book - as useful for men as it is for women - Dr. Northrup explores the essential truth that has guided her ever since medical school: Our bodies, minds, and souls are profoundly intertwined. Making life flow with ease, and truly feeling your best, is about far more than physical health; it's also about having a healthy emotional life and a robust spiritual life. When you view your physical well-being in isolation, life can become a constant battle to make your body "behave." When you acknowledge the deep connection between your beliefs and your biology and start to tune in to the Divine part of yourself, it's a whole new ball game - and the first step in truly making your life easy. Take charge of your well-being as you learn to: - Untie the knots of blame and guilt that harm your health - Use sexual energy consciously to increase vitality - Balance your microbiome through healthy eating - Cultivate a healthy ego that serves you (not vice versa) - Communicate directly with the Divine - And much more Drawing on fields from epigenetics to pastlife regression to standard Western medicine, Dr. Northrup distills a brilliant career's worth of wisdom into one comprehensive user's guide to a healthy, happy, radiant life.